(This article was recently posted to the excellent Active History website). A recent BBC news report highlights some of the key issues in a decades-long debate over heli-skiing in the European Alps. Though heli-skiing has flourished in North America, it faces growing opposition over environmental concerns such as air pollution and threatened alpine ecosystems. In one recent controversy, however, opponents of a contentious heli-ski proposal voiced their concerns about the threat that mechanized recreation posed to cultural heritage in the region surrounding British Columbia’s highest mountain. As human demands on Canada’s natural spaces increase, such convergences of ecological and heritage concerns are likely to become a more common, and perhaps more effective strategy for environmental advocates. Soon after mountaineers began visiting Mount Waddington in the 1920s, the first calls were made to have this superlative landscape protected within a national park. 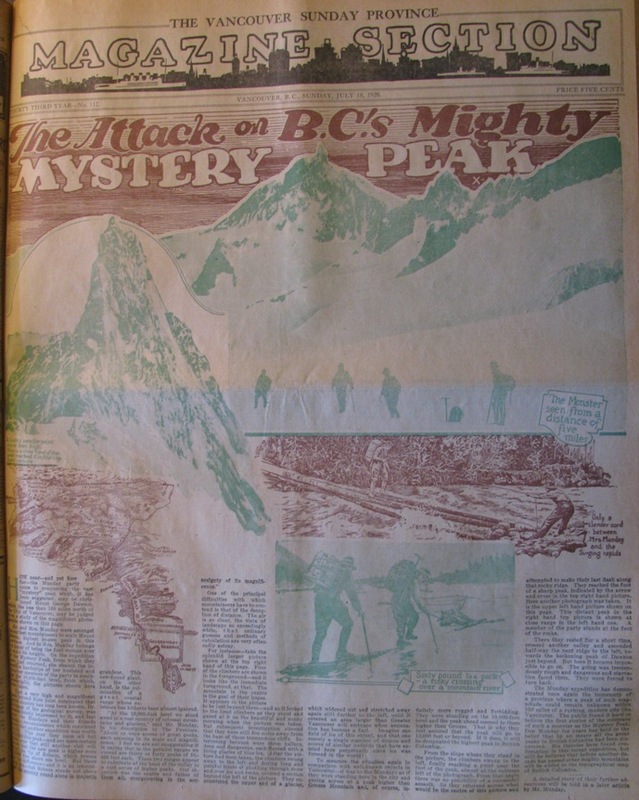 While mountaineers had successfully led similar campaigns such as at Garibaldi Park north of Vancouver, the remote and desolate Mount Waddington landscape was largely ignored by government officials. Over the next eight decades mountaineering parties from around the world continued to visit the region’s massive icefields and near-vertical spires, often likened to the “aiguilles” surrounding France’s celebrated Chamonix valley. Never ceasing completely, park advocacy was renewed in 2007 in response to a proposed 350,000 hectare heli-ski tenure by Knight Inlet Heli Sports. For perspective, this is more than one hundred times larger than Whistler-Blackcomb, North America’s largest ski resort. Opposition continued to mount even as the tenure was awarded, eventually succeeding in having the decision partially reversed. The area surrounding Mount Waddington was removed from the tenure and certain provisions were included to minimize helicopter-mountaineer contact. In so doing, long-standing (and environmentally sensitive) human interests surrounding a remote, geological wonder were acknowledged, and a non-mechanized zone was established around this globally significant mountaineering destination. The Knight Inlet Heli-ski controversy is symptomatic of the development free-for-all that has been going on for years in the British Columbia backcountry. The initial tenure proposal’s massive area was far larger than necessary, in fact too large to service without fuel caches. Elsewhere, ever-growing heli-ski tenures dwarf older operations, and there has been a fire-sale for hydro rights to the province’s rivers. Such policies betray an alarming zeal to develop our seemingly empty and inexhaustible wilderness. Insightful as it was at the time, W.L. Mackenzie King’s oft-repeated aphorism that “if some countries have too much history, we have too much geography” is no longer an apt description of our country. As our natural landscapes become increasingly contested spaces, human interests need not trump environmental concerns. The Mount Waddington controversy reminds us that even in Canada’s most remote corners there is often an under-appreciated depth to past relationships with the land. Creating awareness of cultural heritage in “wilderness” areas, rather than compromising their environmental integrity, can add new layers of meaning and value. Taking seriously the common viewpoint that our backcountry is our backyard can make us more appreciative of our wide-open spaces, and more willing to pursue and protect land-use practices that enrich our lives without compromising our natural environment. Mount Waddington (4,019m) is the highest peak wholly within the province although Mt. Fairweather (4,671m) on the B.C.-Alaska border is higher.